Dr. Howden’s research program focuses on genetic control of cardiopulmonary function at baseline and under specific environmental conditions. Further, Dr. Howden is investigating the mechanisms associated with isometric training induced reductions in human resting blood pressure. Sissung TM, Gardner ER, Piekarz RL, Howden R, Chen X, Woo S, Franke RM, Clark JA, Miller-Degraff L, Steinberg SM, Venzon D, Liewehr DJ, Kleeberger SR, Bates SE, Price DK, Rosing DR, Cabell C, Sparreboom A, Figg WD. (2010) Impact of ABCB1 allelic variants on QTc interval prolongation. Clinical Cancer Research. 17: 937-946. Backus GS, Howden R, Fostel J, Bauer AK, Cho H-Y, Marzec J, Peden DB, Kleeberger SR. (2010). Protective Role of IL-10 in Ozone-induced Pulmonary Inflammation. Environmental Health Perspectives. 118(12): 1721 – 7. Howden R, Liu E, Miller-DeGraff L, Keener HL, Walker C, Clark JA, Myers PH, Rouse DC, Wiltshire T, Kleeberger SR. (2008). The genetic contribution to heart rate and heart rate variability in quiescent mice. American Journal of Physiology. 295(1), H59 – 68. Dr. Howden’s research program focuses on genetic control of cardiopulmonary function at baseline and under specific environmental conditions. Further, Dr. Howden is investigating the mechanisms associated with isometric exercise training induced reductions in human resting blood pressure. Little is known about the likely complex nature of the genetic influence on cardiopulmonary control. Dr. Howden has developed a model for assessing baseline cardiopulmonary function from quiescent, unrestrained, conscious mice. In this model, electrocardiographic (ECG) is recorded by radio telemetry and pulmonary function by whole body plethysmgraphy, simultaneously. Coupling this animal model with available genetic tools, Dr. Howden has identified a number of potential candidate genes. We have identified a region (QTL) on mouse chromosome 6 that associates with between mouse strain differences in baseline heart rate (Figure 1). We are currently investigating the genetic effect of this QTL on baseline heart rate. Figure 1. Genome-wide linkage map for baseline heart rate in 28 AXB/BXA RI strains. The X axis represents the length of the each chromosome, the left Y axis shows the Likelihood Odds Ratio. (LOD; blue line), and the right Y axis shows the degree to which either A/J (green line) or B6 (red line; parental strains) alleles increase phenotypic values. The numbers along the top of the graph indicate chromosome number. The lower horizontal line indicates suggestive linkage and the upper horizontal line indicates significant (P < 0.05) linkage. Adapted from Howden et al. (2008) Am J Physiol Heart Circ Physiol 295(1), H59 – 68. Prolonged hyperoxia (100% oxygen) exposure is an established animal model for Acute Lung Injury, Acute Respiratory Distress Syndrome and Bronchpulmonary Dysplasia. However, little is known about the role of the cardiovascular system in the adverse outcomes associated with these diseases. Using similar tools to those described above, continuous cardiopulmonary function can be recorded during hyperoxia exposure of genetic reference animal populations to describe the genetic contribution to exposure-induced responses. We have identified a region (QTL) on mouse chromosome 9 that associates with between mouse strain differences in heart rate responses to hyperoxia exposure (Figure 2). We are currently investigating the genetic effect of this QTL on baseline heart rate. In recent years, low volume isometric exercise training it has been shown constituently to induce a reduction in human resting blood pressure (Figure 3). Since the exercise training is simple to perform, this paradigm could have important clinical implicates. However, little is known about the mechanisms associated with these changes in blood pressure, an understanding of which could provide the basis for maximizing the therapeutic benefit of isometric exercise training. Figure 3. Mean ± S.D. resting systolic and diastolic blood pressure, before and during 5 weeks of double leg isometric exercise training. 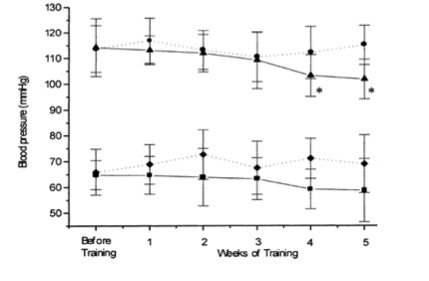 * = P<0.05 compared to before training. Adapted from Howden et al. (2002) Exp Physiol 87.4, 507-515.